Showing results for "hyperkin ps3"
Brand New Wireless Playstation 3 (PS3) Video Game Console Hyperkin Controller This is the official Hyperkin product - brand new! The CirKa Wireless Controller for the PS3 is the perfect option for the most intuitive gaming experience for all your games. Comes with: Ultra responsive dual analog sticks Pressure sensitive face buttons Precise directional pad Rechargeable battery Click here to browse our other auctions - bid on multiple items and save on shipping! Hyperkin Dual Charger for Sony Playstation 3 System. Brand New! Charges to controllers at once! We are concerned about your complete purchase satisfaction. We accurately describe and photograph all items. Please contact us if you are not fully satisfied with this item. Powered by eBay Turbo Lister The free listing tool. List your items fast and easy and manage your active items. Hyperkin Charge Cable for Sony Playstation 3 System. Brand New! We are concerned about your complete purchase satisfaction. We accurately describe and photograph all items. Please contact us if you are not fully satisfied with this item. Powered by eBay Turbo Lister The free listing tool. List your items fast and easy and manage your active items. Hyperkin Wireless Keypad for Sony Playstation 3 System. Brand New We are concerned about your complete purchase satisfaction. We accurately describe and photograph all items. Please contact us if you are not fully satisfied with this item. Powered by eBay Turbo Lister The free listing tool. List your items fast and easy and manage your active items. Hyperkin Quad Charger for Move / Navigation Controllers for Sony Playstation 3 System. Brand New! We are concerned about your complete purchase satisfaction. We accurately describe and photograph all items. Please contact us if you are not fully satisfied with this item. Powered by eBay Turbo Lister The free listing tool. List your items fast and easy and manage your active items. 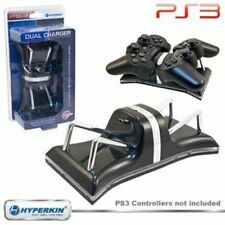 eBay HyperKin PS3 Dual Charger * Great Value * NEW! Hyperkin 3 Port USB Hub w/ SD Card Reader for Sony Playstation 3 System. Brand New! We are concerned about your complete purchase satisfaction. We accurately describe and photograph all items. Please contact us if you are not fully satisfied with this item. Powered by eBay Turbo Lister The free listing tool. List your items fast and easy and manage your active items.